Sui, D.Z., Elwood, S. and M.F. Goodchild (eds. ), 2013. Crowdsourcing Geographic Knowledge. Berlin: Springer. Here is a link to freely downloadable version . 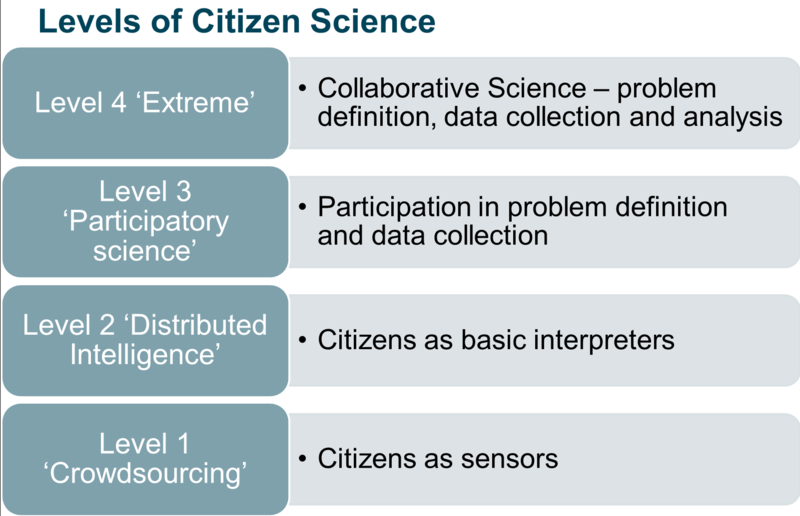 Against the technical, social and cultural aspects of citizen science, we offer a framework that classifies the level of participation and engagement of participants in citizen science activity. While there is some similarity between Arnstein’s (1969) ‘ladder of participation’ and this framework, there is also a significant difference. The main thrust in creating a spectrum of participation is to highlight the power relationships that exist within social processes such as urban planning or in participatory GIS use in decision making (Sieber 2006). In citizen science, the relationship exists in the form of the gap between professional scientists and the wider public. This is especially true in environmental decision making where there are major gaps between the public’s and the scientists’ perceptions of each other (Irwin 1995). In the case of citizen science, the relationships are more complex, as many of the participants respect and appreciate the knowledge of the professional scientists who are leading the project and can explain how a specific piece of work fits within the wider scientific body of work. At the same time, as volunteers build their own knowledge through engagement in the project, using the resources that are available on the Web and through the specific project to improve their own understanding, they are more likely to suggest questions and move up the ladder of participation. In some cases, the participants would want to volunteer in a passive way, as is the case with volunteered computing, without full understanding of the project as a way to engage and contribute to a scientific study. An example of this is the many thousands of people who volunteered to the Climateprediction.net project, where their computers were used to run global climate models. Many would like to feel that they are engaged in one of the major scientific issues of the day, but would not necessarily want to fully understand the science behind it. Therefore, unlike Arnstein’s ladder, there shouldn’t be a strong value judgement on the position that a specific project takes. At the same time, there are likely benefits in terms of participants’ engagement and involvement in the project to try to move to the highest level that is suitable for the specific project. Thus, we should see this framework as a typology that focuses on the level of participation. At the most basic level, participation is limited to the provision of resources, and the cognitive engagement is minimal. Volunteered computing relies on many participants that are engaged at this level and, following Howe (2006), this can be termed ‘crowdsourcing’. In participatory sensing, the implementation of a similar level of engagement will have participants asked to carry sensors around and bring them back to the experiment organiser. The advantage of this approach, from the perspective of scientific framing, is that, as long as the characteristics of the instrumentation are known (e.g. the accuracy of a GPS receiver), the experiment is controlled to some extent, and some assumptions about the quality of the information can be used. At the same time, running projects at the crowdsourcing level means that, despite the willingness of the participants to engage with a scientific project, their most valuable input – their cognitive ability – is wasted. The second level is ‘distributed intelligence’ in which the cognitive ability of the participants is the resource that is being used. Galaxy Zoo and many of the ‘classic’ citizen science projects are working at this level. The participants are asked to take some basic training, and then collect data or carry out a simple interpretation activity. Usually, the training activity includes a test that provides the scientists with an indication of the quality of the work that the participant can carry out. With this type of engagement, there is a need to be aware of questions that volunteers will raise while working on the project and how to support their learning beyond the initial training. The next level, which is especially relevant in ‘community science’ is a level of participation in which the problem definition is set by the participants and, in consultation with scientists and experts, a data collection method is devised. The participants are then engaged in data collection, but require the assistance of the experts in analysing and interpreting the results. This method is common in environmental justice cases, and goes towards Irwin’s (1995) call to have science that matches the needs of citizens. However, participatory science can occur in other types of projects and activities – especially when considering the volunteers who become experts in the data collection and analysis through their engagement. In such cases, the participants can suggest new research questions that can be explored with the data they have collected. The participants are not involved in detailed analysis of the results of their effort – perhaps because of the level of knowledge that is required to infer scientific conclusions from the data. Finally, collaborative science is a completely integrated activity, as it is in parts of astronomy where professional and non-professional scientists are involved in deciding on which scientific problems to work and the nature of the data collection so it is valid and answers the needs of scientific protocols while matching the motivations and interests of the participants. The participants can choose their level of engagement and can be potentially involved in the analysis and publication or utilisation of results. This form of citizen science can be termed ‘extreme citizen science’ and requires the scientists to act as facilitators, in addition to their role as experts. This mode of science also opens the possibility of citizen science without professional scientists, in which the whole process is carried out by the participants to achieve a specific goal. This typology of participation can be used across the range of citizen science activities, and one project should not be classified only in one category. For example, in volunteer computing projects most of the participants will be at the bottom level, while participants that become committed to the project might move to the second level and assist other volunteers when they encounter technical problems. Highly committed participants might move to a higher level and communicate with the scientist who coordinates the project to discuss the results of the analysis and suggest new research directions. The 3rd level where you mention “especially relevant in ‘community science’ is a level of participation in which the problem definition is set by the participants”: is the term “community science” a hybrid definition? Does it have sources from literature? Thank you for the comment – I have defined ‘community science’ in the previous post, or if you click at the beginning of the post on ‘Here is a link to freely downloadable version’ you’ll be able to see the definition in the context of the chapter. I hope that this clarifies what I mean by that.